What worked: This memoir is the account of an undocumented teen living in the US during the 90s. She gives a face to the plight of undocumented immigrants living in our country. 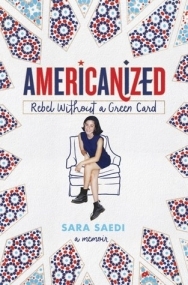 This memoir is filled with humor and raw insights into Sara Saedi's life. Her parents fled Iran and settled in the United States. They tried to become citizens, but their paperwork wasn't found. Readers follow Sara and her families' journey to becoming US citizens. Along the way she breaks down stereotypes that are prevalent in our country right now. I loved how this memoir humanizes the plight of those trying to become US citizens. Sara goes over terminology regarding becoming a citizen. She also shows her life in journal excerpts that are woven throughout this memoir. Sara struggles with being American and Iranian. Her memories of her Iranian family show the love they share. She's the typical teen. She worries whether a cute guy in school likes her. Basically she's a normal teen, only she just happens to be an undocumented immigrant. She didn't find this out until she was thirteen and her older sister shared how she couldn't get an after-school job because she didn't have a Social Security number. Some truths Sara shares: yes, undocumented citizens do pay taxes. Also it's not that easy to become a citizen. The process is long and costly. She also goes over current terminology that is being used today. DACA(Deferred Action for Childhood Arrivals). Political asylum. Adjustment of status. 'Aging out'. She shares how frightening and real the fear of being deported is to others who are undocumented. She also shows her own fears when the current president was elected and the anti-immigration sentiment in our country right now. But she also paints a picture of hope. As a former bilingual teacher, who taught children of undocumented citizens, I totally recommend this book. If anything, it rips apart the misconceptions out there on undocumented citizens and humanizes them.